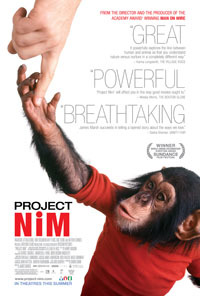 James Marsh’s Project Nim (2011) is something of a fractured biopic. 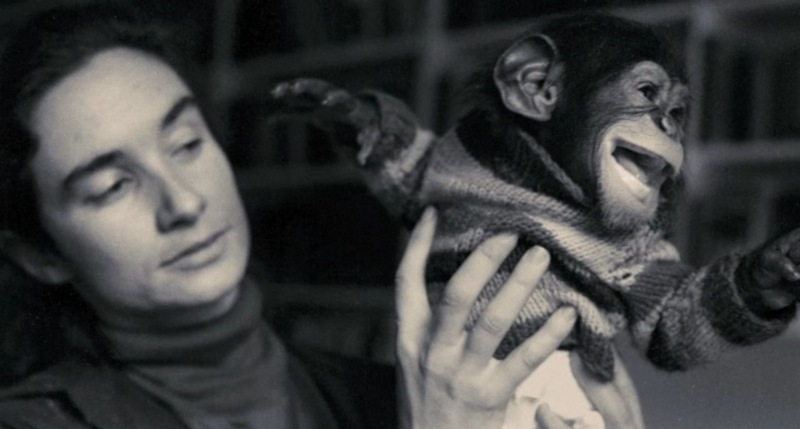 It tells the story of Nim Chimpsky, a chimpanzee reared by humans in order to investigate whether it could eventually communicate by American Sign Language. The head of the project, Columbia Professor Herbert S. Terrace, sought to refute Noam Chomsky’s theory that language is inherent only in humans. Accordingly, he obtained a two-week old chimpanzee and placed it in the custody of a hippie Manhattan family, mandating that it be raised like an ordinary human child. 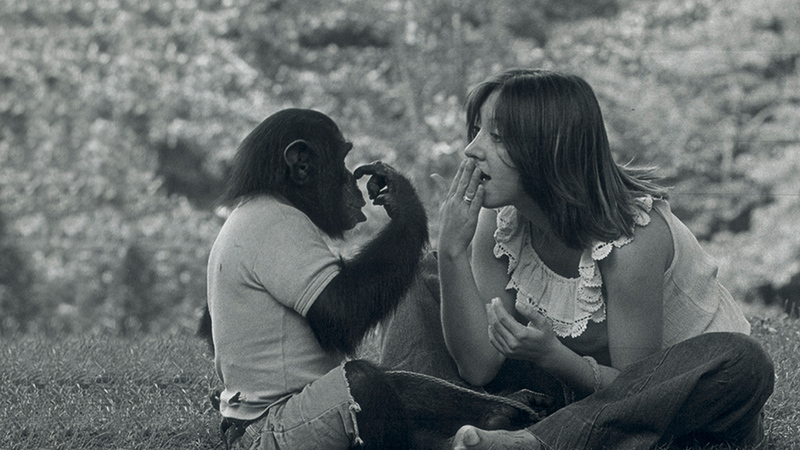 Marsh’s documentary draws inspiration from Elizabeth Hess’ book, Nim Chimpsky: The Chimp Who Would Be Human (2008), which argues against Terrace’s project. In Project Nim, however, Marsh takes a backseat, allowing the individuals principally involved in Nim’s life to reconstruct the story. Nim’s caretakers play a formative role in his education, however, what is unexpected is Nim’s role in shaping theirs. This powerful mutuality, representing the central thrust of the documentary, is artfully captured through a collage of home video footage, candid interviews and dramatic reenactments. Throughout the feature, Nim’s behaviour oscillates between an eerie human likeness and primal impulse, thereby complicating his carers’ feelings toward him. In one scene, for example, he cradles a cat with utmost gentleness but in a later scene, he is depicted dismantling the face of his language teacher. However, Nim’s worst crimes pale in comparison to the heartless manner in which he is raised: as a mere experiment, to be discarded when no longer required and abandoned to the whims of fate. With growing uneasiness, the viewer observes Nim’s tragic descent from celebrity primate to LEMSIP test subject and finally, to an isolated misfit at Black Beauty Ranch (a Texan ranch specialising in the care of formerly abused equines). Ironically, by relating Nim’s life as a failed test subject, Marsh paints a dark and disturbing picture of human limitations. In the follow-up to his much-fancied Man on Wire (2008), Marsh blends an intriguing “nature versus nurture” story with chic aesthetic design, to a surprisingly woeful end-result. Decidedly, the film’s downfall is its unforgivable lack of focus. Marsh manages to broach several compelling issues but without examining any in sufficient detail. As a result of this amorphousness, it is difficult for the viewer to access the film on any meaningful level, whether intellectual or emotional. Illuminating this point are the film’s numerous interviews, which are relied upon heavily to provide structure and emotional impact. Chronologically sequenced to reflect the phases of Nim’s life, they are conducted with Dr. Terrace and his two research assistants (Stefanie LaFarge and Laura-Ann Petitto), Nim’s language teachers (Bill Tynan, Carol Stewart, and Renee Falitz) and Bob Ingersoll, a deadhead psychology graduate who befriends Nim, among others. As interviews go, Project Nim’s are passable. They are touching without waxing maudlin and convey sincerity, without being soporific. But in the end Marsh leaves behind too many loose threads. Trails of beguiling stories are set down toyingly but are ultimately and maddeningly, left untold. The dalliances between Dr. Terrace and his two assistants, Nim’s Oedipal Complex and the public apathy towards media coverage of Nim’s plight, for instance, are pushed to the periphery. Marsh’s shelving of such potentially captivating topics seems careless. The viewer is left frustrated and detached. It is this critical error, as well as a panoramic scope, that renders any specific meaning, insight or emotion hard to entertain, let alone engage with.